In most online stores, users are constantly exposed to the same product offers, regardless of their individual tastes and preferences. Mercadoactual is a Spanish company that offers a large catalog in the IT and electronics sector. They were aware of the importance of the website personalization as the process of creating customized experiences for visitors to their website. Since this process would have been too complicated and time-consuming to be done in-house, Mercado Actual worked closely with Retail Rocket . The challenge was to provide visitors, instead of showing the same webshop to all users, a unique and personalised online shopping experience adjusted to their preferences and needs. This has been done through the Retail Rocket platform that identifies the key features of the products that a user is looking for and offers personalized product recommendations in real-time. Mercadoactual.es is an ecommerce in electronics with a multi-channel sales strategy, with Spanish capital and besides operating in Spain, they also sell in France, Italy, Germany, United Kingdom, Portugal and Belgium. The online store has more than 8,000 unique visitors per day and 170,000 registered customers. Its catalog has over 64.686 of active products in more than 15 different product categories like computers, wearables, printers and cameras, among others. Retail Rocket analyzes the behavior of the visitors of MercadoActual.es and adjusts the website in real time so that each customer gets their own version of the webshop, highlighting the products that they are most likely to buy, based on their preferences and purchase history. Therefore, Retail Rocket’s platform provides Mercado Actual with a set of self-learning algorithms that let the webshop create a truly personalized shopping experience. There are, in total, more than 20 personalization scenarios for each step of the customer journey. 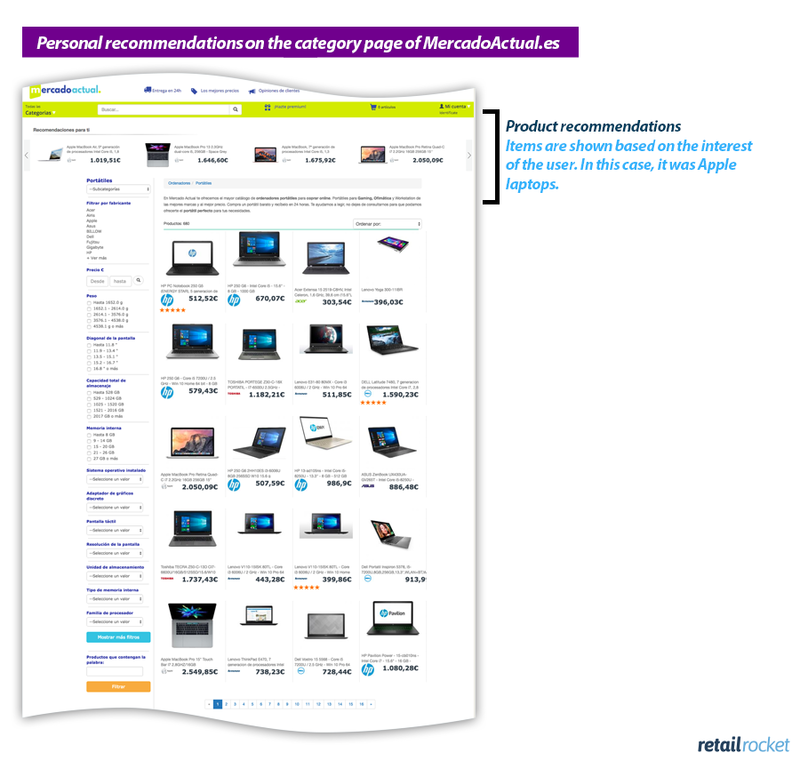 This case study describes how product recommendations are dynamically delivered on Mercado Actual’s homepage and category page and are updated in real-time achieving a conversion increase. The Homepage is the shop window of an online store. In many cases, it is the first place where a visitor decides to stay and enter or leave the website. Visitors will only stay and continue their journey through the website when they see something of their interest, so it is very important to show the right products. 2. Content filtering: based on product properties (brand, price, color, etc.). 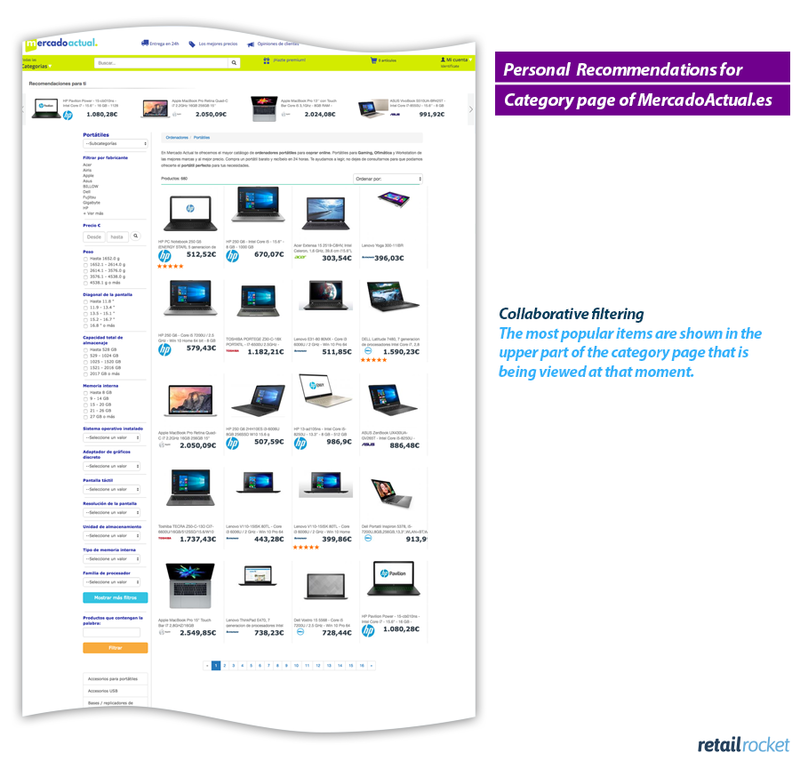 In the case of Mercado Actual if a user looks for a laptop with a price around 1000€, Retail Rocket’s algorithms already detected that “price” is the most relevant attribute for this category and will show products on that price range. 3. Personalization: based on user interests. However, when a user clicks on laptops of the same brand, regardless of the prices, the system will understand that while the global user preference is stronger with prices, for this user, the main attribute is the brand and it will show the products accordingly. The Retail Rocket product recommendations have proven to be effective on the Mercadoactual.es Homepage and Category Page, so during the month of April 2018, the conversion increased by 5,6%. The effect of the Retail Rocket product recommendations, every time a user interacts with them, represents 5.6% of the conversion rate. Recommendations have generated 6% more orders in the total generated per month. 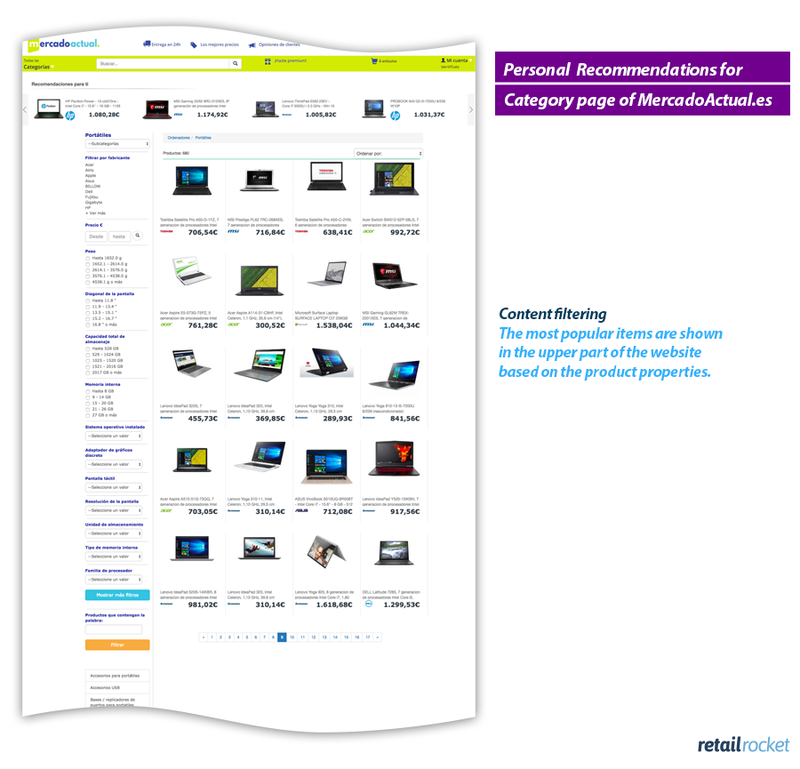 The shopping experience on Mercadoactual.es was improved by suggesting highly relevant products and showing other alternatives for the visitor, which helped visualizing others products from the deep catalog. Retail Rocket, not only personalizes the shopping experience, but also shows products of the same price range depending on the user’s purchase intention and their available budget. With web personalization the user can find the product he needs easily and much faster. This ensures that the user has a pleasant online shopping experience, increasing the chance that a purchase will be made. “We are very satisfied with the Retail Rocket service, totally recommended. We have used other tools that, in theory, covered the same service, but Retail Rocket offers, in our experience, a greater level of “personalization”, a fundamental element so that the client’s usability experience is the best possible. In addition, with Retail Rocket, we have verified that our conversion rate has increased in the medium term and you can always count on them to implement improvements and optimize the results of the platform. If you have a business based on ecommerce, Retail Rocket is a secure partner”.